4th ANNUAL SOCCERTHON - October 19th-20th - 24 hours of continuous soccer.. Save the Date. FC Stars will donate 50% of the total profit made to the Greg Hill Foundation. The other 50% will allow FC Stars to provide financial assistance towards players costs for families in need. 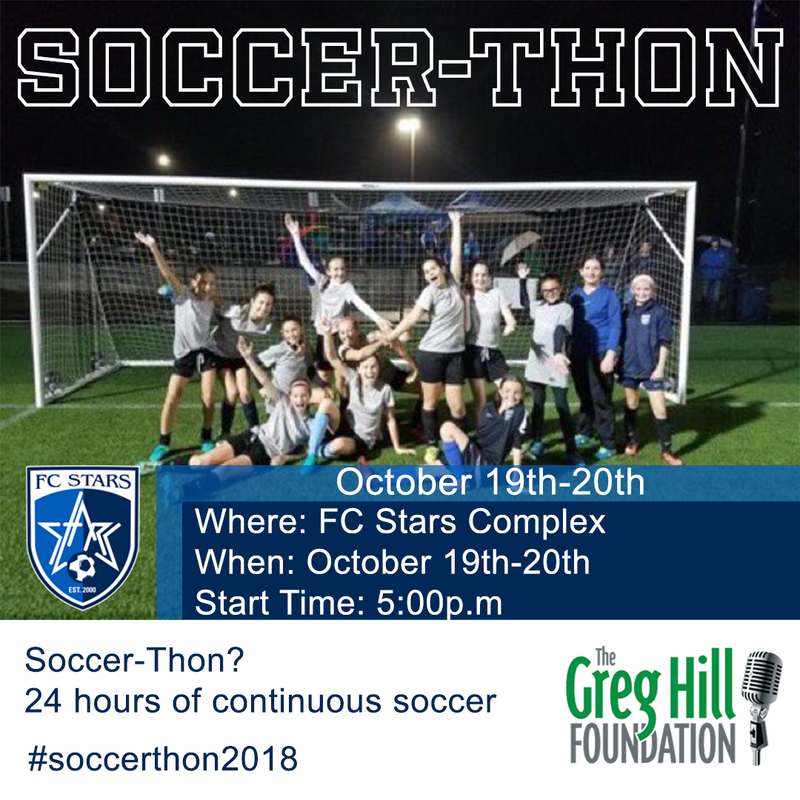 Become a Fundraiser, Online Fundraising platform - Create your own fundraising profile to share with friends and family to help support Soccer-Thon and the Greg Hill Foundation - Compete against your teammates, see who can top the leaderboard..
Equipment Drive - Don't forget to bring any cleats, soccer gear or balls that your family is no longer using! This will be donated to a great cause in Trinidad and Tobago. Doukin Dounts Offer - Purchase a large beverage and save your receipt on 10/19/18 & 10/20/19 and on the same day, receive a smallbeverage with the same content for FREE at the Dunkin Donuts on 1410 Lunenburg Road. Can not be combined with any other coupon and is valid only on 10/19/18. The Dunkin Donuts will also be open the entire day for your convenience. Appreciation Gifts will be given - top earning team wins a custom game shirt! (to be considered for the team prize, team must raise a minimum of $3,000).